An area better known for its salmon and sea trout rivers, the south of Scotland nevertheless has some hidden trout fishing gems. 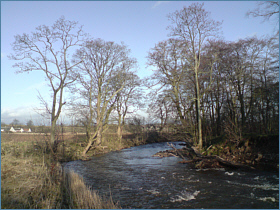 There is excellent trout and grayling fishing in the rivers Clyde, Nith, Annan, Tweed and Teviot as well as many smaller streams and, in addition, some good loch fishing in the Pentland Hills and the hills of Ayrshire, Renfrewshire and Galloway. The map below shows the main trout fishing centres on the southern Scottish mainland, in Lothian, Borders, Ayrshire, Lanarkshire, Dumfries and Galloway. Clicking on a red dot will take you to a page showing detailed maps of each of the main trout fishing areas in the south of Scotland with additional information on the fishing available. 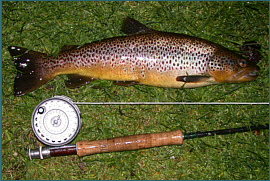 For more information on the excellent trout fishing available on the southern Scottish rivers and lochs, including detailed maps, please select a trout fishing area by clicking on a red dot on the map or on a name in the list to the right of the map.